That’s right! Dan das Mann and Karen Cusolito’s monolithic mother and child sculpture, originally created for last year’s Burning Man event, ‘Passage’, has arrived in the East Bay where it is being re-furbished in preparation for temporary six month installation on the San Francisco Waterfront. The exhibition is part of a continuing model put forth by the Black Rock Arts Foundation to install temporary artworks throughout the city. The model hinged on the success of the the temple built last June in Hayes Green by David Best and the Temple Crew, and continued with an initative to bring five works of art originally created for, and debuted at, the Burning Man event between 2001 and 2005. 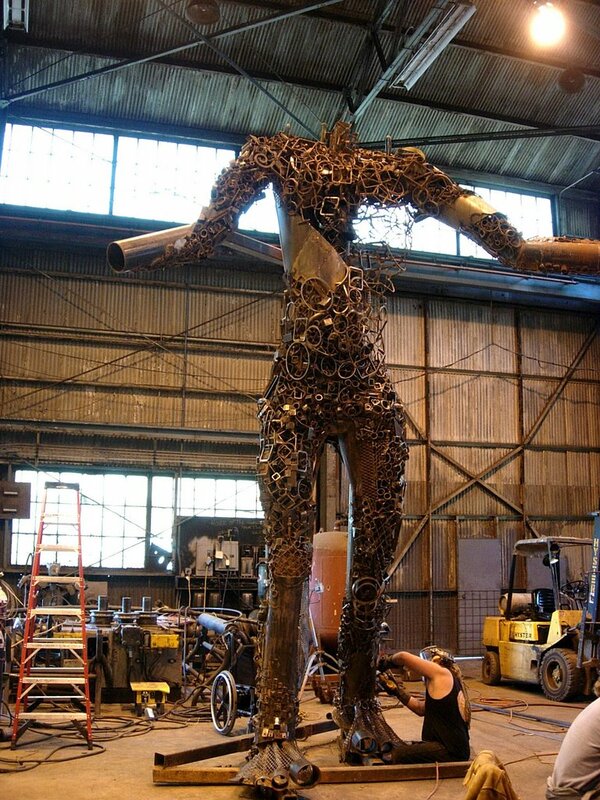 ‘Passage’ will be installed on the Embarcadero (at Mission) during the second and third weeks of June. The piece will open in concert with the the opening of Pier 14, an old breakwater that has been transformed into a public access pier, on June 16th! Join us at 6:00 p.m. for a public dedication before we walk over to Sinbad’s for a no host reception from 6:30 pm – 8:00 pm to celebrate! Pictured here is the headless child being prepared by Goat Man Dan for installation.